Get in the mood for some back to school success with free trainings and events from Formed Families Forward. Though the thermometers don't show it, summer break is coming to a close and formed families are preparing the children and youth in their care to head back to school. We know this can be a tough time of changes for foster, adoptive and kinship families, but we have you covered! FFF has a full line-up of events for families and professionals. Sign up now for the free Back to School Basics webinar on August 25. Tune in from the comfort of your home or office (or last blast vacation trip!). On October 3, focus your student on thinking about transitions ahead with our Taking the Next Step: Transitions through High School and Beyond workshop in Fairfax. And bring the whole family to our Formed Families Movie Night on October 14. Snacks provided! We are rolling movie night for foster, adoptive and kinship families on October 14 from 7 - 9:30 PM. Invite the family to take a TGIF break with us in Fairfax. Children and youth enjoy their own G-rated movie. Next door, parents and caregivers are invited to watch some adoption, foster care, and kinship care-related media and join in a relaxed evening discussion. Snacks served! We will only hold the event if we get enough interest by October 7- please RSVP. Q & A: What and How to Share with New Teachers? Q: My husband and I are now caring for our niece full time. She moved from another state and will be starting 7th grade here in northern Virginia. Her situation is complex and some of the traumas she experienced impact her behavior and her interactions with some adults and peers. I think the teachers at her new school should know about her history but my husband feels she needs a fresh start. What should we tell the school about her history and how do we approach them? A: How much information to share with teachers and other professionals is an important and careful consideration for families formed through kinship care, adoption and foster care. Experts recommend that educators be aware of a student's special circumstances or needs so they can better manage behavior and academics, and support social and emotional development in the classroom (Johnston, 2012; Melina, 1998; NCTSN, 2008). Issues of trust and confidentiality however, may make families cautious. Further, in the case of older children like your niece, a teen may have specific privacy preferences. Families must balance a youth's right to self-determination with the potential benefit of teachers' awareness and support of unique needs. Develop clear parameters on what information your family is comfortable sharing. We encourage parents and caregivers to help their children create a brief "elevator speech" that helps them tell others about their needs. The National Gateway to Self-Determination and the Department of HHS (see page 8) offer some suggestions. The Center for Adoption Support and Education offers a SAFE at School Manual for Teachers, Educators, and School Counselors to support adoption-sensitive practices at school. 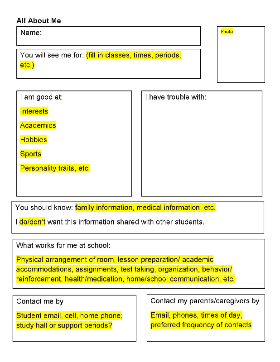 We have an All About Me template (find a fill-able one HERE) that can be used as a one-page introduction to educators and others. The sheet can be shared in person or electronically before school begins, and provides a quick "heads-up" for staff who are meeting a new student for the first time. Special education case managers and school counselors can also help arrange conferences before school begins or within the first few weeks so families can directly share information that may be particularly sensitive. Kids aren't the only ones headed back to learning; many free and low-cost training events await parents, caregivers and professionals this autumn. Check out offerings from FFF and friends! August 16- Special Education Advisory Committee training, from PEATC, Woodbridge. August 17- Ensuring Educational Stability for Children in Foster Care webinar from the US Departments of Education and HHS. Weekly series, free. August 18- Virginia DD Waiver Redesign webinar with The Arc of Northern Virginia. 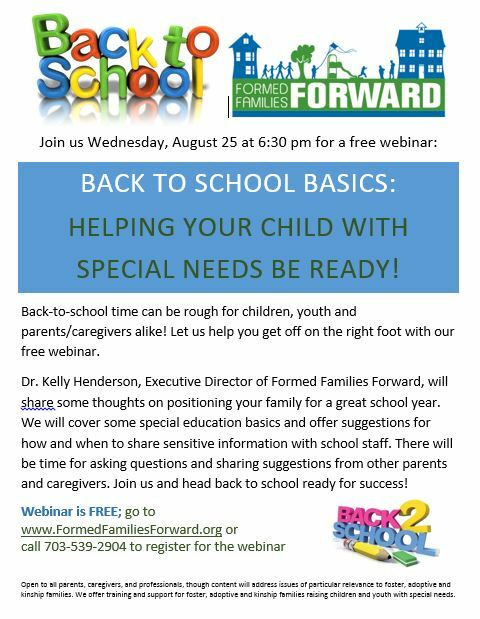 August 25- Back to School Basics webinar from FFF. 6:30 - 8 PM. September 13- 2016 State of Grandfamilies in America Report Release by Generations United, Washington DC. September 16-17- PEATC's Parents and Youth Exhibiting Strength Summit, Williamsburg. September 19- Building Family Organizations in Virginia with Millie Sweeney, hosted by NAMI of Virginia, Richmond. September 26- Northern Virginia regional Kinship Symposium, Alexandria. October 20- Creating a Financial Roadmap and Funding Special Needs Trusts, with The Arc of Northern Va, Leesburg. October 22- Q and A with neuropsychologist Dr. Federici, Fairfax. Contact Alpha Moms for more information. October 29- Fairfax County Public Schools Wellness Conference, Fairfax High School, save the date. November 5- Circle of Support conference sponsored by The Arc of Greater Prince William, Woodbridge. November 10- Building Healthy Families: LEAN Essentials workshop with Dr. Klimenko, hosted by FFF, in Herndon. Mental Health Experience to Share? Parents and caregivers who have experience navigating behavioral and mental health care can be valuable resources for other families. Consider these opportunities for supporting your peers and yourself! Job Opportunity- Magellan of Virginia is hiring Family Support Coordinators in many regions of the state including Alexandria, Arlington and Fairfax. Learn more HERE. 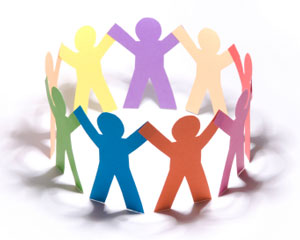 NAMI of Northern Virginia offers many year-round support groups for parents, caregivers, and other family members. Find the full list HERE. And Formed Families Forward will initiate our 2016-2017 Stronger Together peer support groups for youth and young adults ages 14-22 in October. A concurrent group meets with parents and caregivers. Let us know if you might be interested HERE. Did you H-app-en to Miss this Summer's Apps? 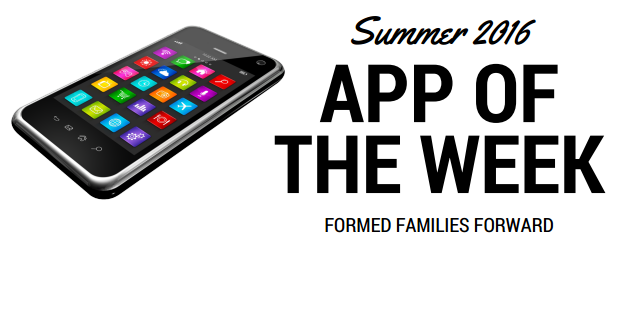 This summer, Formed Families Forward has featured an App of the Week, focused on tools of value to foster, adoptive and kinship families raising children and youth with special needs. Each week through Labor Day we share a new app on Facebook. The entire list of featured apps can be found HERE. Formed Families Forward was pleased to learn last week that our application for a Community Parent Resource Center grant from the U.S. Department of Education was awarded. The five year grant award allows FFF to continue its work to provide training, support and resource navigation to northern Virginia's foster, adoptive and kinship families raising children and youth with special needs. THANK YOU to the U.S. Office of Special Education Programs for recognizing the value of informed and empowered parents and caregivers! day on Facebook. LIKE us on Facebook and get great information just for formed families and professionals who care about adoption, foster care and kinship care.